It is time. My days and nights have been spent in this nourishing haven of a place, among other traveling artists. 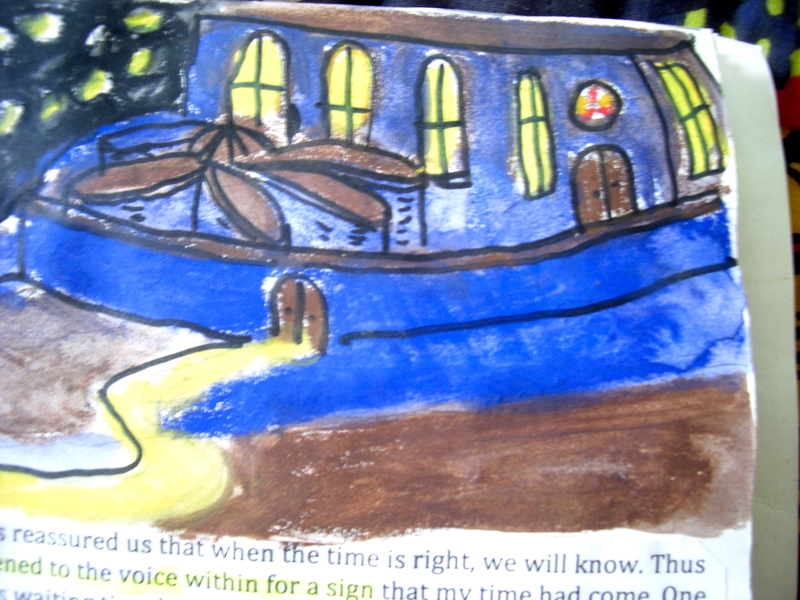 Some artists have already undertaken their journeys and some are still making their preparations. 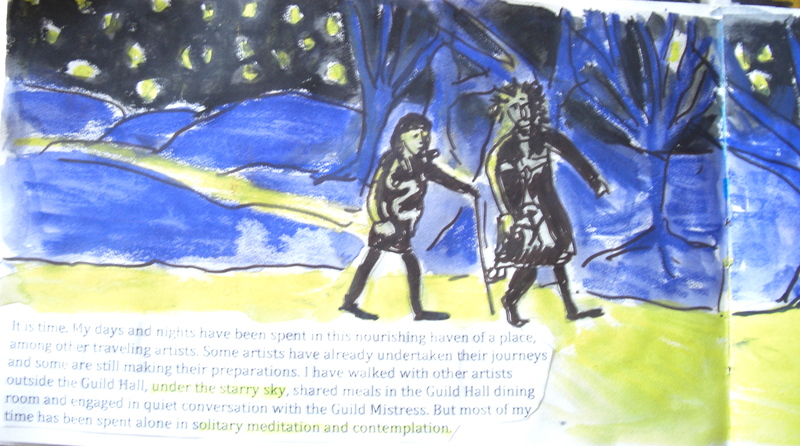 I have walked with other artists outside the Guild Hall, under the starry sky, shared meals in the Guild Hall dining room and engaged in quiet conversation with the Guild Mistress. But most of my time has been spent alone in solitary meditation and contemplation. The Guild Mistress has reassured us that when the time is right, we will know. Thus I have waited and listened to the voice within for a sign that my time had come. One of the highlights of this waiting time has been watching the Going Forth ceremony for the ones who left before me. I greatly enjoyed watching the faces of each of the other journeyers as they took part in the ceremonial Going Forth from Journey Hall. I was struck by how different each one’s ceremony was, and yet, a thread, a deep respect for the power of art and of the power within each one of us as women (and as men, as there are also two men journeying this time) ran through each one. I particularly noticed how each artist, though outwardly vastly different, had a similar expression on his or her face when the final moment came to leave. No matter whether she or he walked to the center of the Compass calmly, excitedly or with slight trepidation, each had the same luminous expression of peace as she took her leave. It was as if the Chanters message was able to impart exactly what was needed to unlock the journey door for each of the artists. Each had a small smile on her face and a confident stride, after hearing the Chanters. I chose a spot in the Hall to observe each Going Forth with care, not wanting to be too close to be seen myself, but wanting to be close enough to see their faces. It was a spot just above the central compass, but not as high up as the uppermost gallery. I found a passageway leading from under the foundation of the Hall, directly to this spot. At times I have wondered if there is something magical about this passageway, as no one else even appears to be able to see it. Until now. This time, as I stand here on the Compass awaiting my own call, I look up to see a face looking down at me from my accustomed spot. For a moment I lose my concentration, that startled am I. Peering into those eyes, I think I recognize her and then I don’t. Because she is gone, disappeared into thin air. Was this just my imagination? If so, how fitting, for a place called Imagine-Nation. But I must focus my attention now. No more distractions. I wear my cloak as my own protection in preparation for the journey and as a protection to the others who watch my Going Forth (in the same way as I watched so many others.) I have kept my powers in abeyance here at the Guild, causing me some effort and strain. I am not sure what the Going Forth might provoke in me, what kind of transformation might occur. My cloak is there as an assurance that all will be safely contained. My suitcase, filled with the maps and guides, the remedies and antidotes, and the journey book is near me and will be given to me as I move on. The Kalili doll, I know, is already safely stored in the niche near the entrance to my journey path. The soft voices of the Chanters begin. I close my eyes and my mind is still. As I attune my senses to the Chanters, individual threads of language unravel themselves from what at first is a diffuse tapestry of sound. Layer upon layer of chanted words, some clear and new, some indistinct, as if roused from ages of slumber. I recognize the ancient Mexican language that is in my blood, the Greek words, the Druidic, the Norse and lightly interwoven with these darker languages, the words in English. Each language stimulates all of my senses, each carry with then a corresponding aroma, taste, physical sensation and color. The older the words, the darker the color and muskier the smell. My body is afire, no longer under my control, something stronger and higher is in power here. I absorb the words into my being, knowing that with the words come the knowledge and wisdom that will carry me through my journey. Time passes but I do not know how long I have been standing here. I am beginning to feel weak, not sure if I can manage this any longer. Just as I have the sensation that I am about to faint, there is a change in the chant. One voice rather than the many. A simple guiding song. It tastes like golden sunlight. Not accustomed to so much light but somehow this seems right. NOW. I hear the firm voice and I step forward confidently, knowing that I will always have the assistance and guidance that I need, no matter how challenging the journey. The Guild Hall closes behind me as I move into an entirely new and strange place. My journey has begun. How delightful! I love the details you included, like the passage that no one else can see and the person standing in your spot. Have a wonderful journey and return with riches of all kinds. Thanks for your good wishes. Not sure yet what is next but await it with excitement and delight.